In the first of our Labour leadership interviews, David Miliband tells Krishnan Guru-Murthy "the good society is defined not just by a good government but by a strong community". 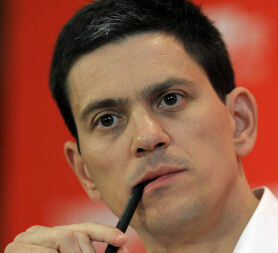 David Miliband is both the front runner in this leadership election and the underdog, writes Krishnan Guru-Murthy. Since 2007 he was regarded as the man most likely to challenge Gordon Brown, or to take over when he finally went. He is widely regarded, even by those who don't support him, as a clever man who thinks strategically and has an intellectual pragmatism. Despite various attempts to distance himself from his past as Tony Blair's big thinker David Miliband is still regarded as essentially a Blairite. While all the candidates try to shed those definitions it still means David Miliband is one least likely to tell the unions and the left of the Labour Party what they want to hear. Yet he could also be the candidate most focussed on those voters who were attracted by New Labour, but have now deserted the party for David Cameron's Conservatives. However this takes some reading between the lines as the fact he is having to appeal to Labour Party members means certain issues, such as low pay and equality are taking a much bigger role in this leadership election. It is ground the elder Miliband is comfortable on, with his past role in Labour's Social Justice Commission in the early 90's, but many also want to know if he has changed his view of Britain's role in the world since serving as Foreign Secretary. So why is he an underdog too? The decision by younger brother Ed to stand against him has divided the media, the Labour luvvies and ordinary members. Lots of them have backed the younger brother seduced by the idea that he is more media friendly and displaying a ruthlessness towards his brother that one might want in a leader. He is also closer to the unions and the big ones are backing him. The assumption that even if people vote for David first they will back Ed second means that if David doesn't win on the first count, the inclusion of second preference votes could mean Ed prevails in the end. David's intellect is also seen by some as a weakness - they worry about whether he will connect with ordinary voters. He is not a traditional party man, and so many Labour figures don't really know him well enough to be passionate advocates of his personal skills. When you speak to David Miliband it seems he is very aware of these concerns and is suitably focussed on making his message clear and easy to understand. He is very confident as an interviewee, and speaks in quite short answers. Given how many hustings there have already been it is clear many of his answers are now well rehearsed, but he certainly still sounds like there is conviction behind what he is saying. So what is his vision and what does he believe? "I believe in movement politics, not machine politics," David Miliband says. "I believe in movement politics because that's the way not just you win support for change, but it's the way you deliver change. "The Labour party was founded as a social-ist party, not a state-ist party and it's very important that we remember that the good society is defined not just by a good government but by a strong community and by a dynamic private sector. "Building change in community when Labour is out of power and Westminster, is not just something to bide our time while we seek power, or a way of making it more likely that we'll gain power. It's actually what we should be into all the time." He points to the 1,000 community volunteers being trained during his campaign: "We can only succeed as a country if we are a place that is an open society where merit is rewarded, if we are a pluralist society where power is redistributed and if we are a society which celebrates its global connection." Where is your favourite holiday destination? I have to say the next place I'm going which is Northumberland. So what does David Miliband offer as unique as leader of the Labour party? "The ability to fire the imagination of the public as well as the party, the ability to unite the party, the ability to be a credible prime minister against David Cameron," he says. "I can say with absolute clarity and honesty and testimony from others that I have gone through this campaign talking to the public as well as to the party. "I can say with absolute clarity that I haven't said things in this campaign that I wouldn't have said in public. I can say that I have been true at every stage to how I would seek to run the party in the future and that is very important." But he denies that he has changed his position since being evicted from government. "I've been true to what I believe in at every stage. And I've been as clear about the need to continue to reform welfare and education and our economy in a way that's been true to my politics. "And I've always been as passionate about private sector reform as about public sector reform, but what I'm seeking is the chance to do that as leader of the party. "I am the candidate best placed to help change the country in a progressive direction, change the country by building a Labour party that can be an alternative government and not just a fighting opposition, change the country by being a political party that's in touch with the real needs as well as fears of the people of this country, and change the country by being a credible party for economic and social renewal." He refers to the Conservative agenda as a "backward-looking credo". "They lack the egalitarian impulse, and that is a massive problem," he says. "I think they misunderstand the relationship between government, private sector and community because they believe that it is only government that can abuse its power, not the private sector, and I think that they misjudge Britain's place in the world." Miliband criticises the Conservative policy of cuts as "one which threatens our economy as well as the fairness of our society". "It will have economic effects as well as social effects and it's very important that we are able to tackle the new government for the damage they are doing to our economy, not just the damage that they are doing to fairness in our society." He is equally critical of the coalition's foreign policy, such as David Cameron's recent visit to India. "It is about trade relations and that is far to narrow a view," he said. "Britain's place in the world is about ideas, it's about power, it's about values, it's about trade and economic place as well, but Britain's international assets are far greater than the ability to trade." "I think (the Labour party) understands some of the reasons why it lost. It's got a better understanding than it had before, but it's still in a process of listening and debating. "But I think that it's becoming clearer and clearer that we weren't proud enough of our record, humble enough about our mistakes or clear enough in our offer." He points to the 10p tax "fiasco" as exemplifying "people's doubts about whether we knew where we wanted to take the country, whether we knew who's side we were on and whether we were able to chart a course forward." He defends Labour's record on the economy, saying: "The truth of the matter is that there was a global recession made in Wall Street not a British recession made in Downing Street and it's very important that we fight that misrepresentation of the actual truth of the matter." But he admits that "while I think people thought that in administrative terms that the way in which we protected their savings, the way in which Gordon and Alistair prevented a slide into depression was probably right, they wanted more about where we were going to move into the future, and that was where the clarity of the offer suffered." Does he regret any of his decisions while in government? "I am the candidate that can say both that I spoke up publicly and privately about the travails that the government was suffering from in office, and I'm also the candidate who has not tried to rewrite the record afterwards and I've stood by both the achievements and the problems, taking responsibility both for the achievements and the problems of the government." Similar remarks have been seen as a dig at his opponents, particularly his brother Ed and Ed Balls, but he insists that it is not meant that way. "I'm just setting out what I've sought to do in this campaign and it's been a campaign about the needs of the country, abut the requirements of the party and I'm the candidate who has sought to make this a campaign that is outward looking and forward. "I think that the campaign has been one of the Labour party coming to terms with its new status as the sole opposition party and it's the beginning of a process of repair that is badly needed. It certainly cannot be the end of the process of repair." "It's going to be a different Britain and a different world that we face come the next election," he says, adding that years of the current government will change the country. "It will require us to show not just what we would have done different from them but how we would offer a different future for the country." What is your commitment to reducing income inequality in Britain and how would you like to see it done? The commitment is real - income inequality is one of the inequalities that mars Britain. When I wrote the report of the Social Justice Commission in the 1990s we said very strongly that not all inequalities are unjust but those that are need to be tackled, and that's what I feel strongly. There are a number of ways in which one can address the gap that exists between different income groups. One way is to raise the incomes of those at the bottom, which is why we were right in our manifesto to say that we should link the minimum wage to earnings, but wrong not to tell anyone about it. In respect of the superclass at the top there is no question that the system of remuneration committees in which a small number of people sit on each other's remuneration committees and give each other large bonuses is one that needs to be made more transparent and accountable - I think one important way of doing that would be for employee representatives to sit on remuneration committees. It has to be done from both ends really. How can you move back from being seen as the party of punitive tax to the party of aspiration? We're hardly seen as the party of punitive tax, more people attack us for not bringing in a 50p tax on bankers bonuses earlier rather than attack us for bringing it in. Our tax system needs to serve the interests of our economy, the need to raise funds for public services and the need for fairness. It also needs to be a green tax system that serves the needs of the environment. I've said that for the course of this parliament I don’t see how the 50p tax could be removed given the fiscal needs of the country and the need for the burden to be borne fairly in a way that expects those with the broadest shoulders to bear the greatest share of the burden. I'm not making commitments beyond this parliament. Do you think your father would be proud of New Labour's performance in government? Some aspects of it - he would be proud of the minimum wage, he'd be proud of the renewal of our health and education systems, he'd be proud of what we did on gay rights, he'd be proud of what we did on crime, to reduce crime. He wouldn't be a supporter of a number of other aspects of our record. How deep would you say is your hatred for the Conservative party? I hate what they do to the country because I see it in my own constituency. One of the great things about the British political system is that every aspirant prime minister is also a constituency MP and so can see with his or her own eyes what damage or difference is made to the lives of people. I represent a constituency which includes a significant number of the most vulnerable in our society and I see what the difference Conservative government makes to them. So I hate what they do to the country but that's not to impugn their motives as individuals. Channel 4 is not responsible for the content of external websites. Andy Burnham targets Labour's 'ordinary' person. Keep track of Sir John Chilcot's Iraq war findings day by day. Revealed: the stories they didn't want to tell. Channel 4 News tells you how to unearth information.